This map shows the beginning of the original 13 United States, from the Atlantic Ocean west to the Mississippi River. Spain claimed everything from the Mississippi River west, all the way to the Pacific Ocean, plus the watershed drainage on the Gulf of Mexico. 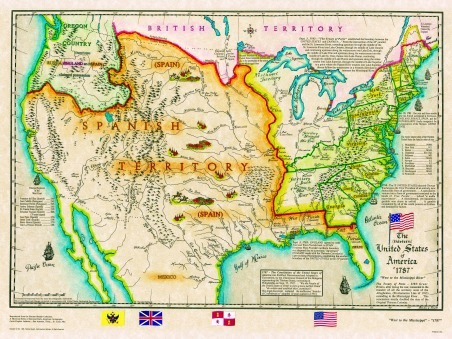 The treaty of Paris created a new nation in 1783 and doubled the size of the original 13 colonies, extending the western boundaries to the Mississippi River. The United States Constitution replaced the Articles of Federation and new government of the people, by the people an for the people was formed. Here you will find the original-13-states. From Delaware of 1781 to Rhode Island of 1790. 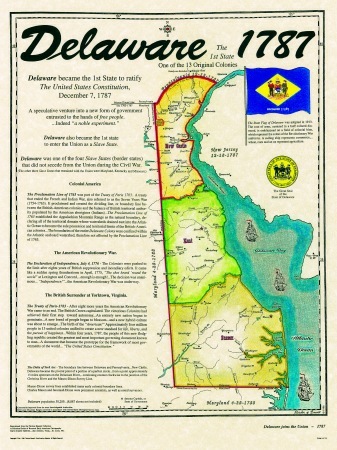 Delaware was the 1st state to ratify the U.S. Constitution. 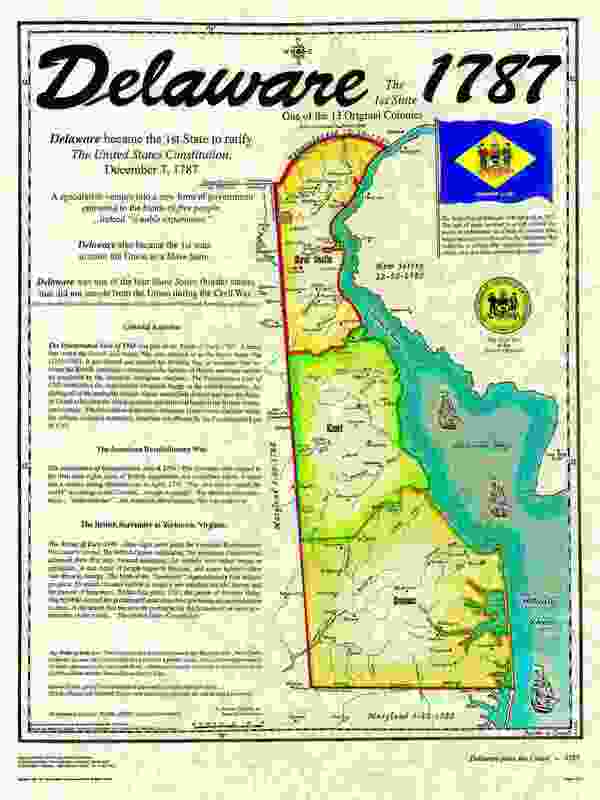 Delaware entered the union as a "Slave State". The State Flag of Delaware was adopted in 1913. The coat of arms, centerd in a buff colored diamond, is emblazoned on a field of colonial blue, which represents the color of the Revolutionary War uniforms. A sailing ship represents commerce and the wheat, corn and an ox represent argriculture. 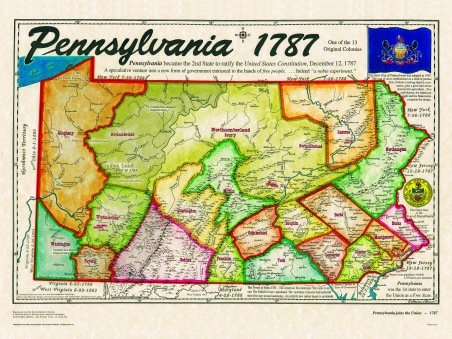 The 2nd state to ratify the U.S. Constitition on December 12th 1787 and entered the Union as a "Free State". The State Flag of Pennsylvania was adopted in 1907. The coat of arms, emblazoned on a field of puritan blue, features a sailing ship for comerce, plus a plow and wheat sheaves for agriculture. Two draft horses, the American eagle and the state motto complete the design. 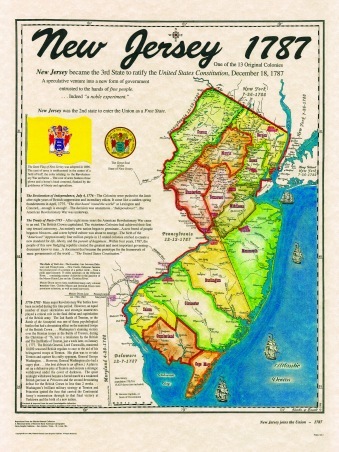 On December 18th 1787, New Jersey was the 3rd state to ratify the U.S. Constitution and entered as a "Free State". The State Flag of New Jersey was adopted in 1896. The coat of arms is emblazoned in the center of a field of buff, the color relating to the Revolutionary War uniforms. The coat of arms features three plows ans a horse's head centered, flanked by the goddesses of liberty and agriculture. 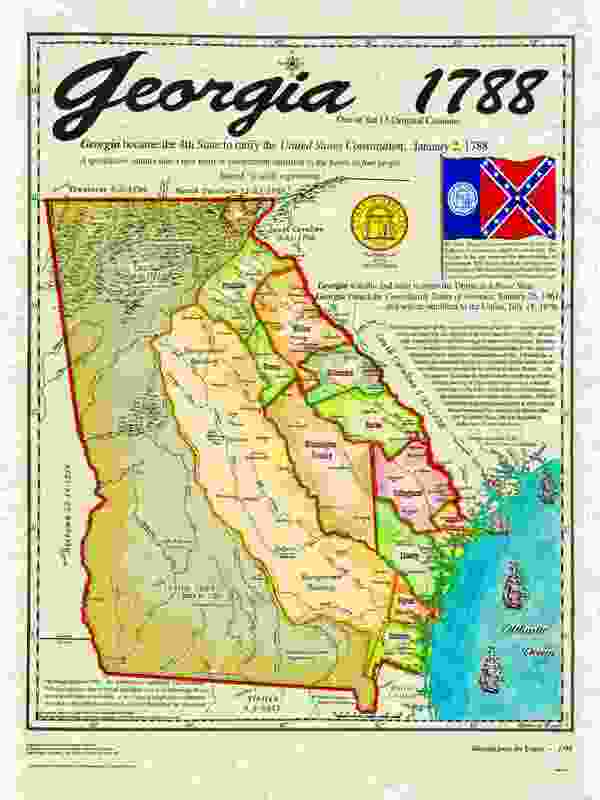 In 1788 Georgia was the 4th state to ratify the U.S. Constitution. The State Flag of Georgia was adopted in 1956. The State seal in centered in a field of puritan blue. The 3 pillars in the seal represent the three branches of government defended by the State military forces, Wisdom, Justice and Moderation. 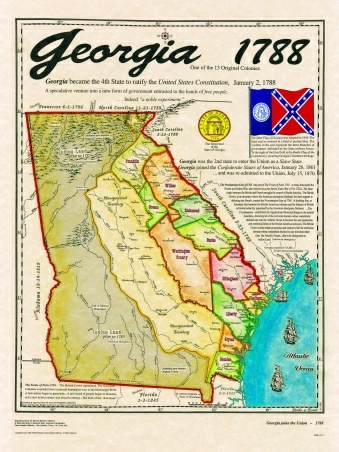 To the right of the blue field is the Battle Flag of the Confederacy, recalling Georgia's Southern heritage. In 1788, Connecticut became the 5th state to ratify the U.S. Constitution. 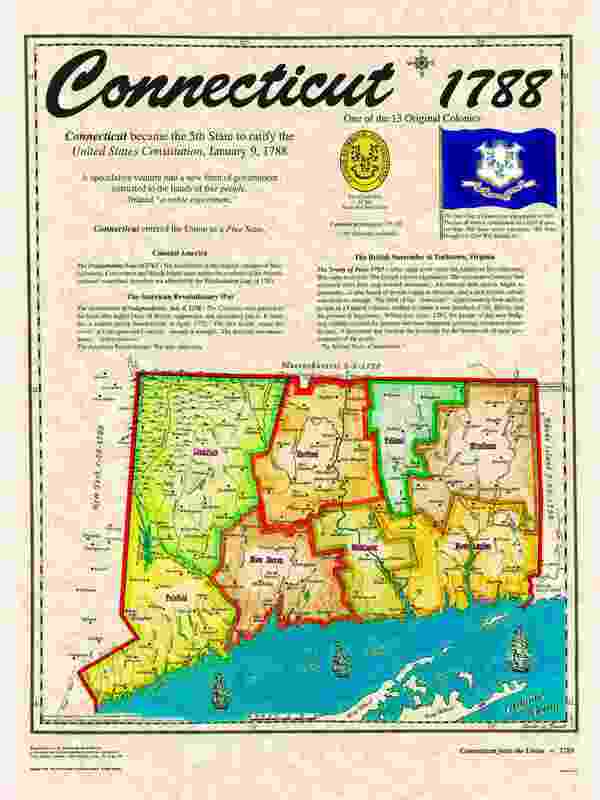 The State Flag of Connecticut was adopted in 1897. The coat of arms is emblazoned on a field of puritan blue. The State motto translates, "He Who Brought Us Over Will Sustain Us." On February 6,1788, Massachusetts became the 6th state to ratify the U.S. Constitution. 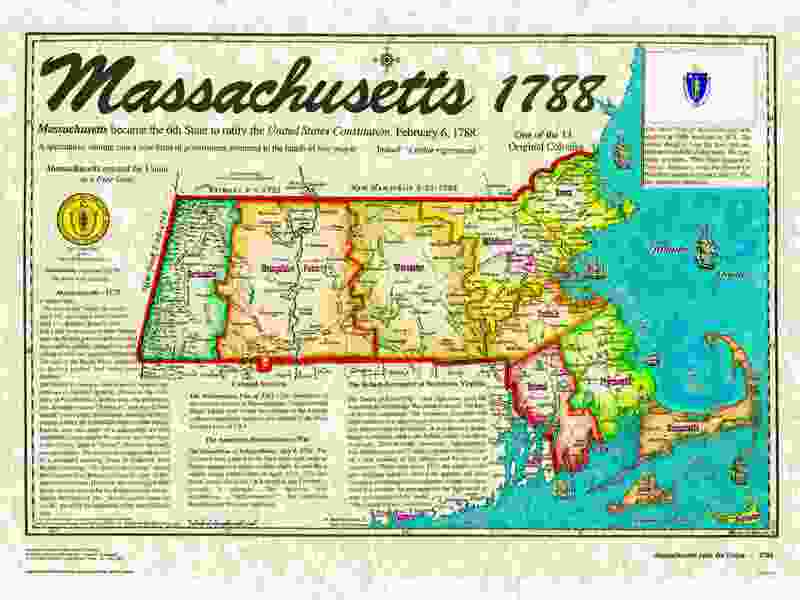 The State Flag of Massachusetts was adopted in 1908, modified in 1971. The central design is from the State seal emblazoned on a field of pure white. The State motto translates, "This Hand Opposed to Tyrants Searches,with the Sword for Peaceful Conditions Under Liberty". 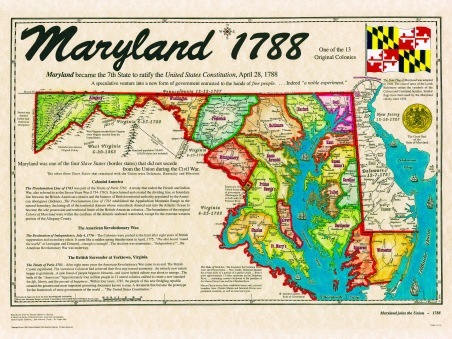 April 28th in 1788, Maryland became the 7th state to radify the U.S. Constitution. The State Flag of Maryland was adopted in 1904. The coat of arms of the Lords Baltimore unites the symbols of the Calvert and Crossland families. Similar flags have been used by the Maryland colony since 1634. 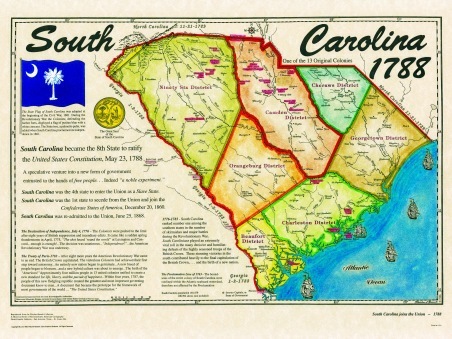 South Carolina became the 8th state to ratify the U.S. Constitution. 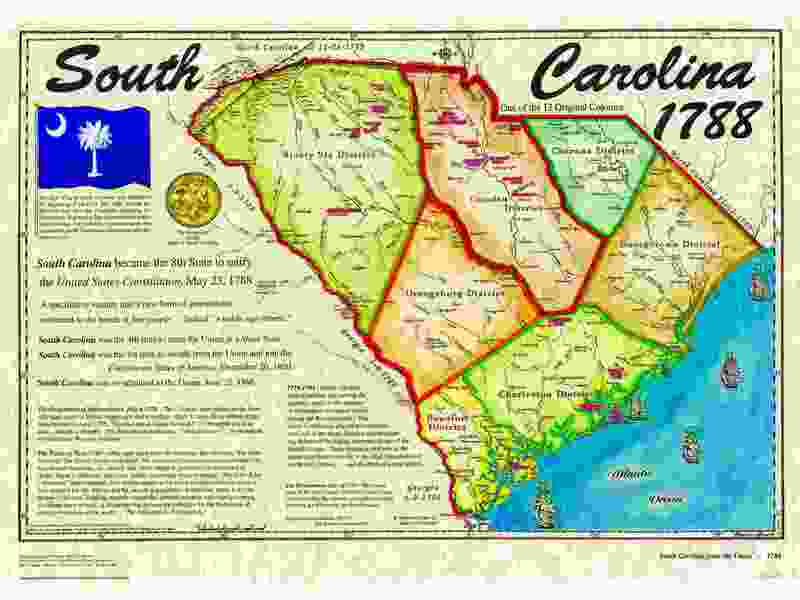 The State Flag of South Carolina was adopted at the beginning of the Civil War, 1861. During the Revolutionary War the Colonists, defending the harbor forts, displayed a flag of puritan blue with a white crescent. The State tree, a palmetto palm, was added when South Carolina proclaimed its independence in 1861. On June 21st, 1788, New Hampshire became the 9th state to fatify the U.S. Constitution. 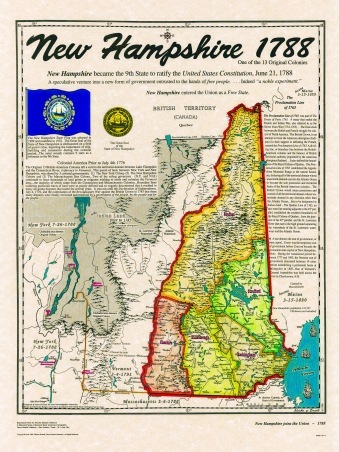 The New Hampshire State Flag was adopted in 1909 and modified in 1932. The Great Seal of the State of New Hampshire is emblazoned on a field of puritan blue, depicting the importance of ship-building and commerce during the colonial period. The outer wreath contains 9 stars as a reference to the 9th State. 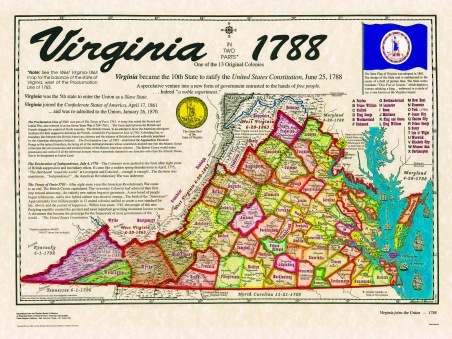 June 25th of 1788, Virginia became the 10th state to ratify the U.S. Constitution. 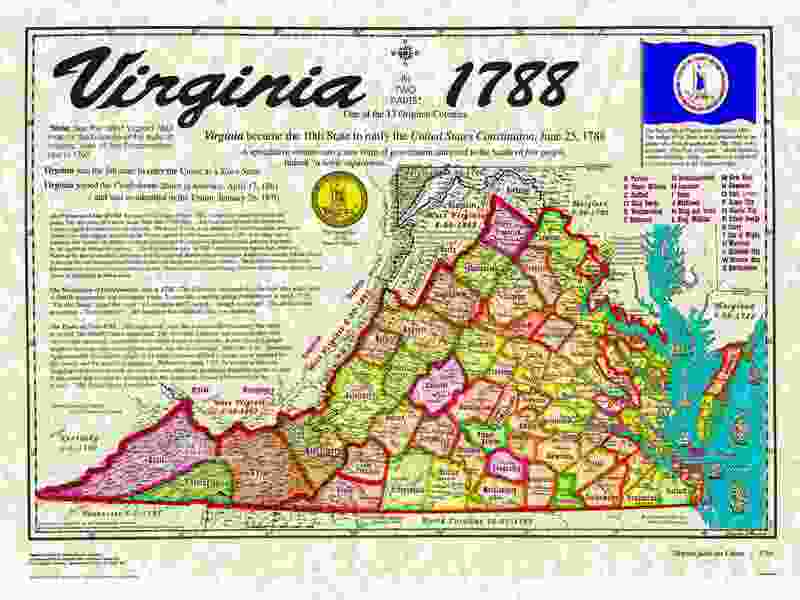 The State Flag of Virginia was adopted in 1861. 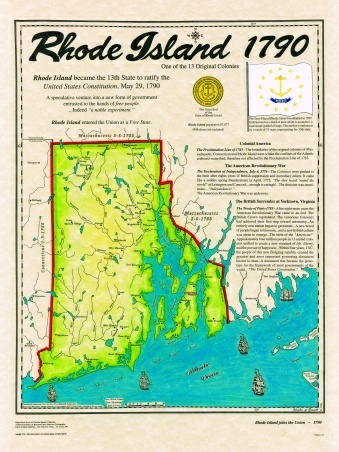 The design of the State seal in emblazoned in the center of a field of puritan blue. The State motto translates "Thus Ever to Tyrants", which depicts a woman subding a king, embraced in a circle of ivy, a vine known as the Virginia Creeper. 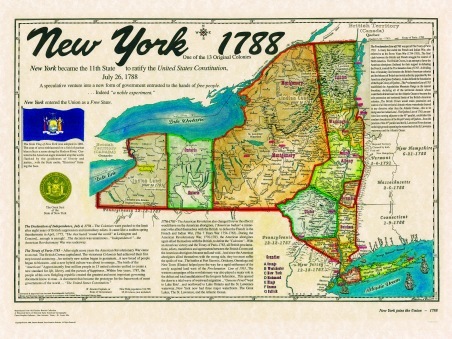 The 11th state to ratify the U.S. Constitution was New York on July 26th 1788. 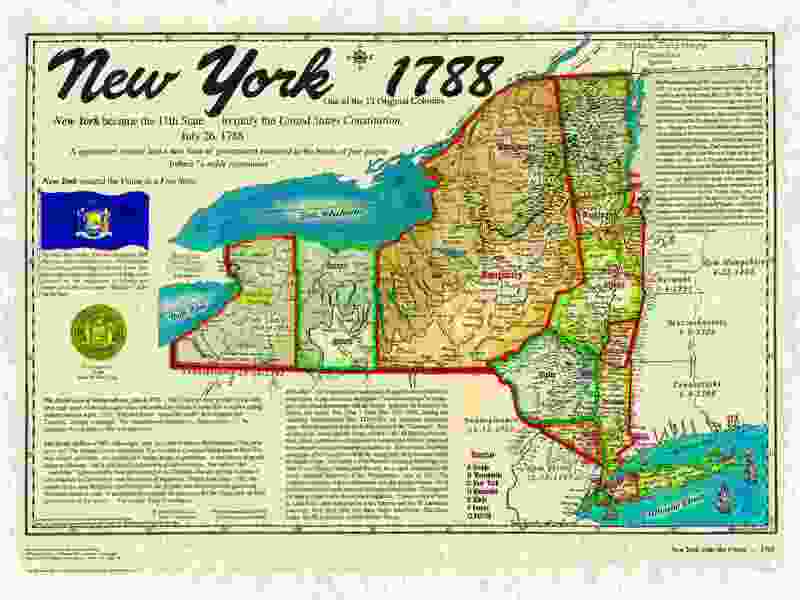 The State Flag of New York was adopted in 1901. The coat of arms emblazoned on a field of puritan blue reflects a scene along the Hudson River. Centered is the American Eagle mounted atop the world. Flanked by the goddesses of liberty and justice, with the State motto, "Excelsior" forming the base. 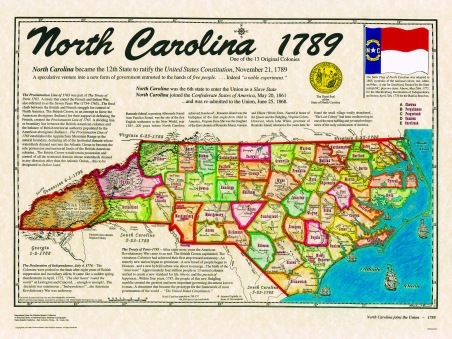 North Carolina became the 12th state to ratify the U.S. Constitution, in 1788. 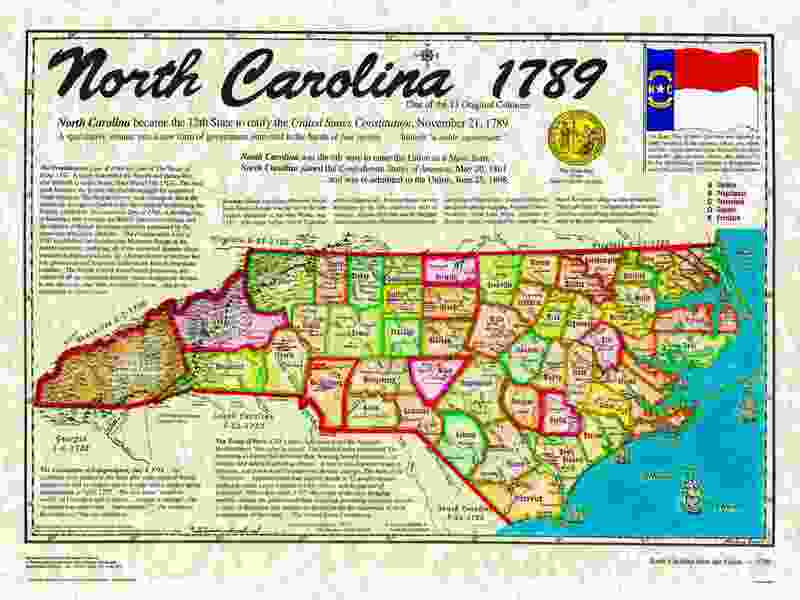 The State Flag of North Carolina was adopted in 1885, symbolic of the national colors red, white and blue. A star for Statehood, flanked by the State initials NC, plus two dates. Above, May 20th, 1775, for the Mecklenburg Declaration of Independence and below, April 12th, 1776 for the Halifax Resolves. 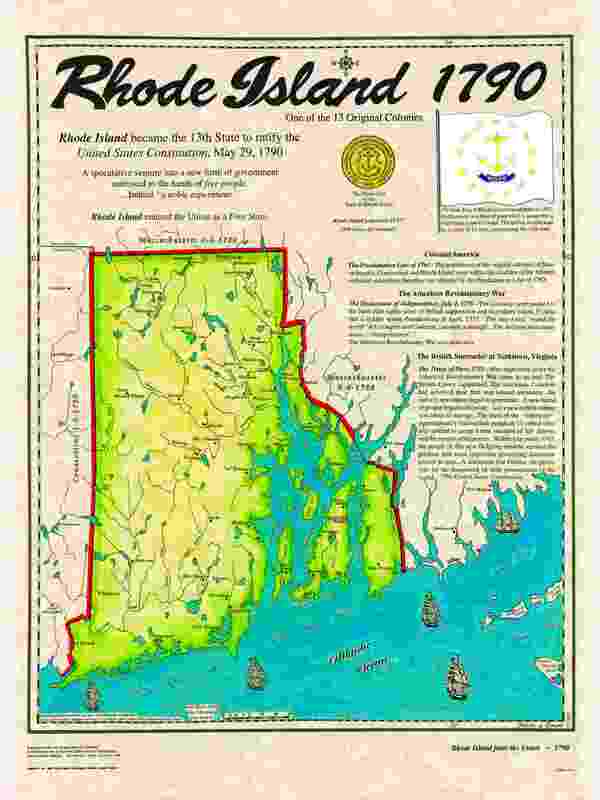 On May 29th, 1790 Rhode Island became the 13th state to ratify the U.S. Constitution. The State Flag of Rhode Island was adopted in 1897. Emblazoned on a field of pure white is an anchor, a traditional symbol of hope. The anchor is embraced by a circle of 13 stars, representing the 13th state.